Search and Rescue group based in Birmingham, Alabama. People often ask what we carry with us when training or on an actual search. Granted, there is a lot of physical equipment we have to take; backpacks, compasses, maps, GPS trackers, and basic survival gear to name a few. And of course, the K9s themselves. But beyond that it’s important to be mentally and physically equipped to handle the search and the challenges that come with it. And one of the most important things we carry with us is our relationship with First Responders and others in the community. 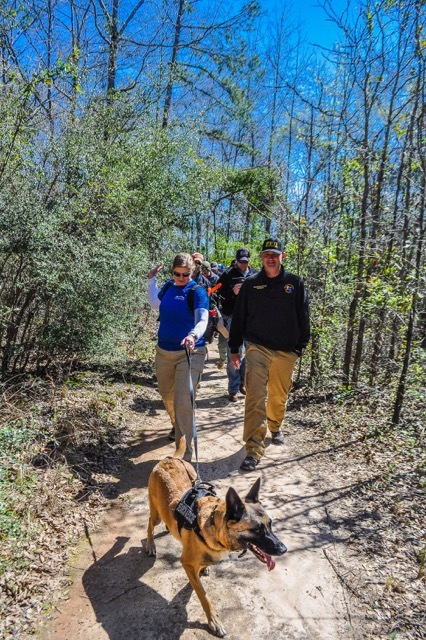 Which is why we feel it’s equally important to equip those community partners with the facts about K9 Search and Rescue teams and how to use them as a resource. 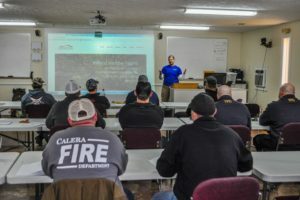 While on a search a few weeks ago, we were afforded the opportunity to meet Ricky Roberts, Battalion Fire Chief at the Prattville Fire Department and program manager for the Alabama Fire College. We saw first hand the seamless teamwork between First Responders and K9 teams and Ricky realized that learning about K9 SAR could be an important component of fire department training. So he invited us to come to Prattville and make a presentation to his upcoming class, the Alabama Fire College Rescue Technician: Wilderness. On March 13, I joined K9 Handler Emily Smythies to talk about Red Mountain Search Dog Association and do a demo with Brie. 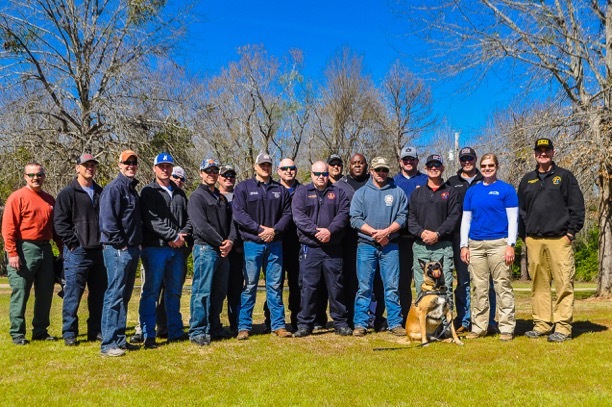 The road from Birmingham to Prattville is relatively easy but we realized it was a significant part of the team’s journey to build partnerships with first responders. On the way we looked at the talking points and went over what Emily would cover in class, trying to prepare for the questions we thought they’d ask and contemplating what kind of demo search we’d be able to do. For us, training is normally in the woods, trudging through creeks, up the sides of hills, and through the inevitable briar patch or privet. Pulling up to the Prattville Regional Training Center, a huge red tower loomed overhead. Yeah, if we think hiking up a mountain is a challenge, imagine repelling off the side of a 50 foot tower for training. For a moment I thought, “wow, what can we teach these guys exactly?” Part of me wonders if some of them were thinking the same thing. As we walked into the classroom you could see the fire department flags proudly hanging on the wall, and rather familiar props of a backpack, walking stick, and other survival gear. The next time we have someone lost these are one of the first people I’m calling. I imagine we did not fit the normal criteria for “instructors.” But after being introduced by Chief Roberts and having him say, “the next time we have someone lost these are one of the first people I’m calling,” they seemed to become intrigued and then engaged. 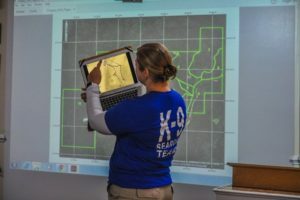 Emily began with a brief overview of what K9 Search and Rescue is and the different kinds of dogs and techniques (air scent, tracking, trailing, and HRD). Then she went into more detail about our own team; how we train, how often we train, what our specialty is, and our national certifications. 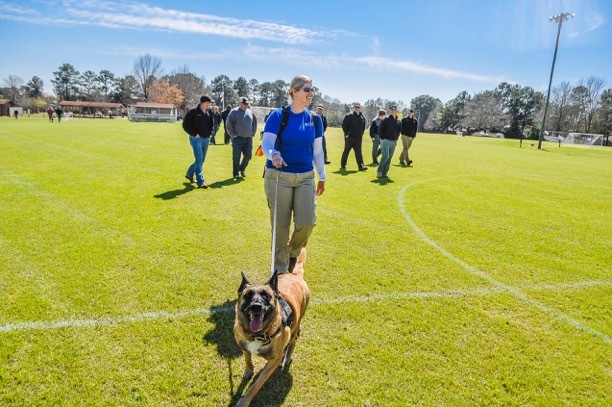 All K9 handlers and the K9s themselves are NASAR certified, having to pass both a written and field test. Everyone on the team, regardless of position, has to be a SARTECH II (or at least a STRETCH III) in order to be called out. We also discussed why those certifications are important (including what that will mean to them if we’re called to help them in a search). Chief Roberts was quick to tell them that the NASAR course we have to pass is even more detailed than the Wilderness course they are currently taking; a fact that surprised us as well. Emily then talked about scent articles, how to handle them, and how dogs can still search effectively if no scent article is available. Before we could even get to the official “question” time, hands were raising. 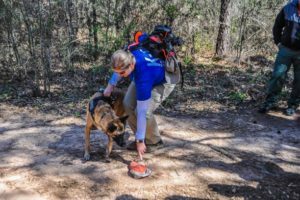 Many of the questions involved how the dogs know who they’re looking for and how they distinguish between the other searchers in the area, etc. Chief Roberts pulled up one of the maps from the previous search we’d participated in to show students how the search areas are divided and how teams are deployed when multiple K9 teams are involved, allowing each K9 team their own section so dogs aren’t crossing paths. As with most things, it’s easier to understand when you see it than when you hear it, which leads me to the most powerful part of the presentation. After class we all caravanned to a local high school where there are some trails. Emily got Brie out of the car and began preparing her for work. It’s amazing how a dog can change the tone of any group and immediately cell phones were coming out to take pictures and hands reaching out to pet Brie, as if instead of a group of grown firemen it was a Boy Scout troop. As they say, if you want to sell anything use dogs or babies. So it became pretty clear that if they weren’t completely sold on using a K9 team yet, it would now be on Brie’s shoulders (or haunches) to make the final pitch. As we crossed the athletic field toward the woodline, I looked back to see Brie in front with the entire class walking behind her. If it had been a scene out of an action movie, they all would have been walking in slow motion with Brie being the leader of the team. We followed a well worn trail into the woods that basically circled a thick, overgrown area (with privet, of course). As we discussed the best way to demonstrate how Brie works and put theory into action, it was decided that we’d send three of the guys down the trail and have them cut into the woods. One of them left his hat on the ground for a scent article. The goal was that Brie would not only find the group but pinpoint the one who had left his hat, to demonstrate how the dogs can discriminate between one person and another and understand that’s who they are looking for on a search. To me, one of the most poignant moments of the day was when they discovered we, and other teams like us, do not get paid for our services. 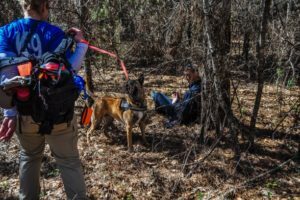 They were surprised to find out that often we will take days off work to go to a search and that we cover most of our own expenses, including the care of the K9s. Our response? Sure, we sometimes have to put our life on hold to train or go to a search. But they and other First Responders risk their own lives every day to serve the community. By the end of the day I think it’s safe to say we all had a better understanding of how we could work together. As I write this, that same group is in the middle of a wilderness survival exercise, having been dropped somewhere out in the woods and told to find their way out. I can’t help but think they might be secretly hoping to hear that bell and see Brie come around the corner.